During the summer I made great progress on a quilt I'd had in mind for a while. It started life as a piece of unfinished patchwork I found in a second-hand shop years ago. 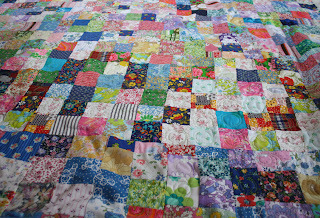 I loved the vintage fabric in the patchwork, and couldn't bear to cut it into pieces, so it stayed as a metre-long (ish) piece and I left it in a cupboard for years, not knowing quite what to do with it. It sometimes got lucky enough for an outing, where I'd stare at it thoughtfully, admire the 70s patterns, fold it up and put it back. And there it sat, waiting for the muse to arrive (on the number 76 bus I think, that's usually how it arrives). 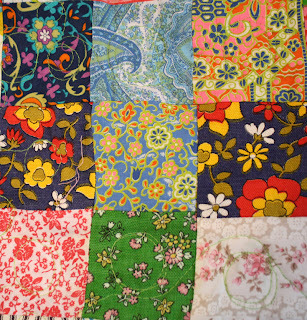 This is part of the original bit of patchwork. It's equipped with a charming degree of wonkiness! Whoever made it struggled with the different weights of fabric and in trying to get the seams to match up. Or, well, who knows, maybe the person didn't struggle - they just didn't give a hoot! anyway. Back to the story. 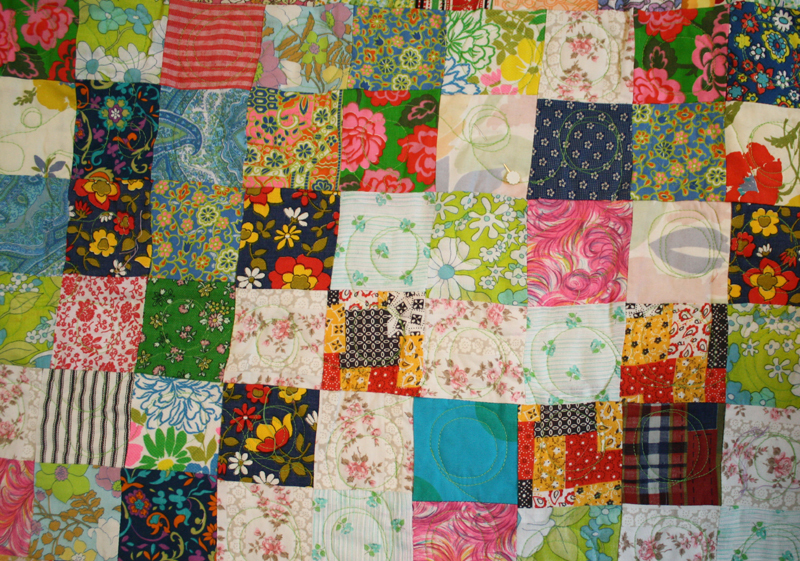 The muse got off the 76 bus, walked down the lane, into the house and slapped me roundly about the chops whilst proclaiming "you should make a quilt in the style of the original bit of fabric! Equipped with a degree of wonk!" It was like a quilter's game of Whose Line is it Anyway. 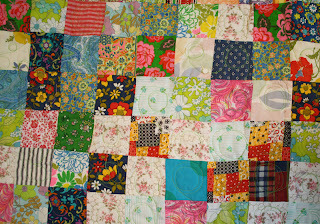 A quilt in the style of.......a wonky quilt! So about it I went. And after a few days of slicing and dicing, I had this. How I love those vintage bits of fabric! I tried to keep within the theme of the original with the colours and 70s styles. 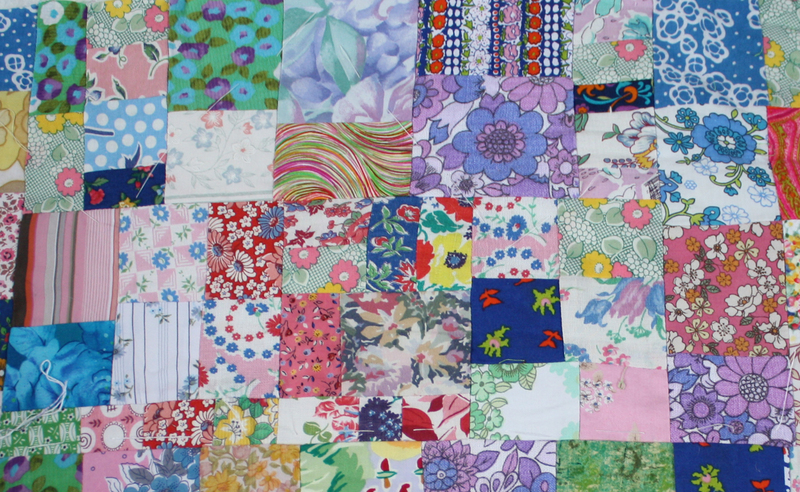 I put in old shirts, skirts, sheets, duvet covers, old aprons, in fact any old bits of vintage fabric I'd been collecting over the years. Not that it's made much of a dent in the shameful stash! 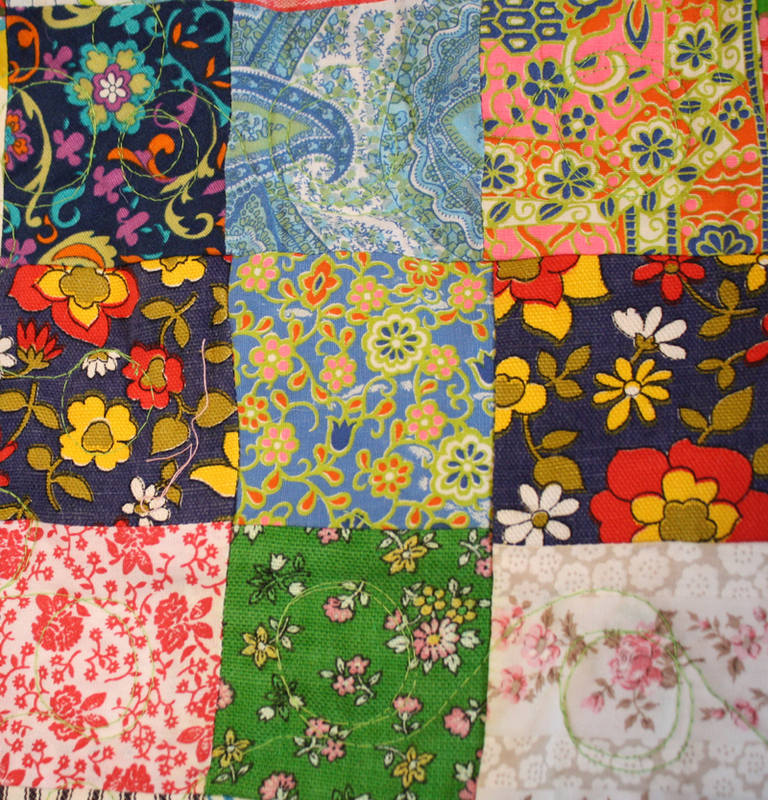 To make up the size I slipped in a couple of new fat quarters too. As you can see, I haven't bothered about lining up the seams. I wanted it to be totally randomly pieced. I didn't want matching perfect squares or lined-up lengths. I love working without a plan or a sketch! (possibly why I don't get on with knitting patterns...). So that's how it turned out. 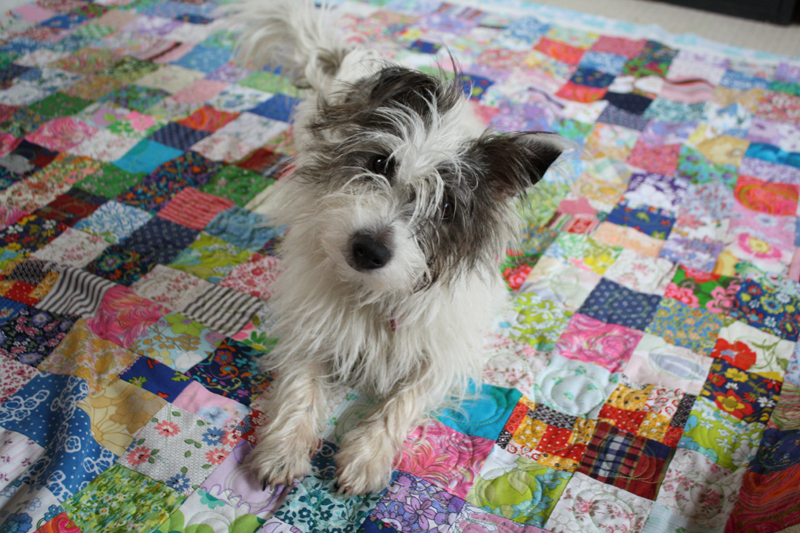 The scribbly quilting needs finishing, then it needs binding (urgh). But I'm nearly there. And here's the ultimate test: does the dog like it? New follower, found your blog through your shop so thought I'd say hi. I love the bright colours in that patchwork, beautiful!